It’s a sad irony that after waxing lyrical about The Salutation earlier this week, the gardens are now under water, drowned by this week’s tidal storm surge. Naturally, head gardener Steven Edney is devastated, sharing images of waist-high water around his precious glasshouses and prize specimens via his Twitter feed. I find it hard to imagine how heartbreaking it must be to have your pride and joy submerged so mercilessly. Hundreds of homes and gardens in Sandwich were evacuated and subsequently flooded, a similar scenario repeated all down England’s east coast. 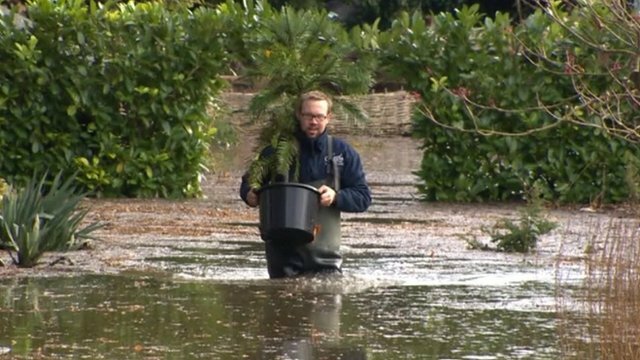 Steven Edney rescues a potted specimen from the gardens at The Salutation (photo, BBC). Here in Broadstairs we’re fortunate that most of the town sits high on chalk cliffs, out of harm’s way. The vast sand bank constructed annually on Viking Bay provided little resistance when the surge reached Thanet – no trace of it remains this morning. 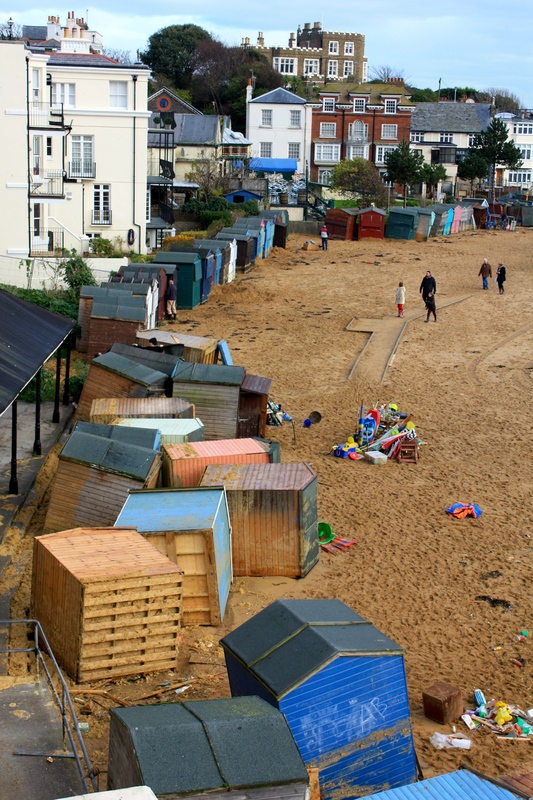 The beach huts and gardens it was built to protect have been tossed around and dumped like discarded toys – a sorry scene to wake up to. 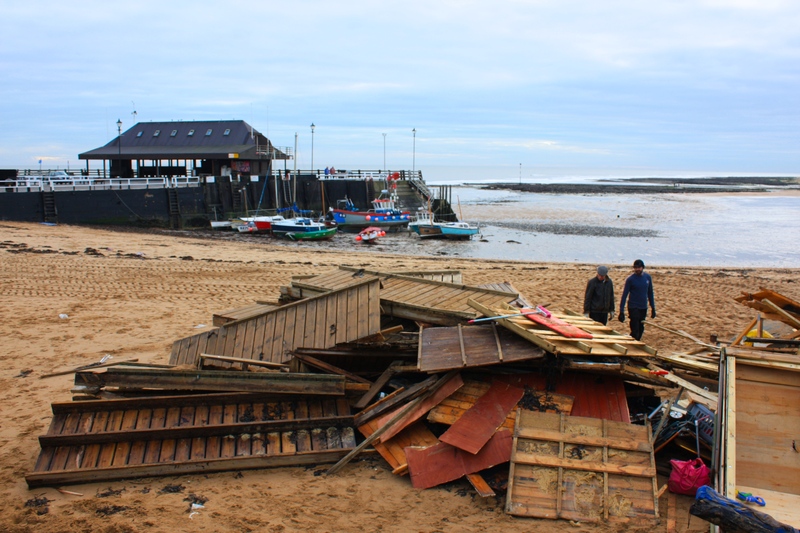 In true British spirit, hut owners are down on the beach, salvaging what they can of their buckets and spades, deck chairs and barbecues. It’s a harsh introduction to winter and hopefully no indication of what’s to come. Salvaging what the sea left in its wake. Back at The Salutation, the waterlogging cannot have come at a worse time of year, with the water table already high and little sun or warmth to dry the ground out. The yuccas and kniphofias pictured above will not enjoy a winter with their roots soaked in water. Frustratingly the Environment Agency seem unwilling to help pump the water from the grounds of the Grade 1 listed house. In this situation, with plants starved of oxygen, time is of the essence. It sounds like Mr Edney is built of stern enough stuff to triumph over adversity. Nevertheless my heart goes out to him, his team and everyone else in the UK was effected by flooding this week. The timber boardwalk, mingled with the remains of numerous beach huts on Viking Bay this morning. What a devastating storm … good luck to all with the clear-up. Thank you. Our garden is completely untouched so we are the lucky ones. I’m so sorry for your devastation. We’ve had our share here in the US including Hurricane Sandy who tore up the New Jersey coastline and they have not recovered yet. It is an uphill battle but the English are a strong bunch – may the recovery go well. Goodness, yes, this was nothing like as bad as Sandy, although for the people who lost their homes over the edge of cliffs in places like Norfolk in must have felt like the end of the world. WOW!!! Wish I were there to help. The photo of the beach huts tossed around is beautiful but so dad.